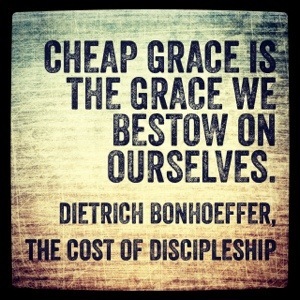 I just started Dietrich Bonhoeffer’s book The Cost of Discipleship. I’ve read the intro and half way through the first chapter, so not very far in. But I’m already struck by how he characterizes the problems with Church of his time. The church of cheap grace. The unorthodox “churches” of our time have at least dropped the theological pretext and have adopted the universally loving, totally nonjudgmental, he is so cool with that, small g god. We have so overused the word god, I think we don’t even know what it means anymore.